Several months ago I noticed the vision in my left eye was getting worse and worse. I couldn’t read road signs, the computer screen was hard to see, making measurements in my shop was difficult and the print of books were blurry. After consultation with a doctor, I was told that I had cataracts that needed to be removed. The lens of the eye works much like a camera lens, adjusting for both changing light conditions and the eye’s focus, letting us see things more clearly. A cataract is a clouding of the eye’s natural lens, which, over time, may grow larger, clouding more of the lens and making it harder to see. After further diagnosis and examination, today was set for cataract removal surgery. While the technique is intricate, it is also a very common surgery with few negative after effects. After only two hours at the clinic, we were on our way home. Our spiritual vision—outlook on life and view of other people—can be similarly clouded when there is a buildup of negative attitudes and thought processes, critical attitudes, unchecked prejudices. We too often allow uninformed opinions, especially about ethnicities or lifestyles, cloud our vision and thus cut ourselves off from people unlike ourselves. 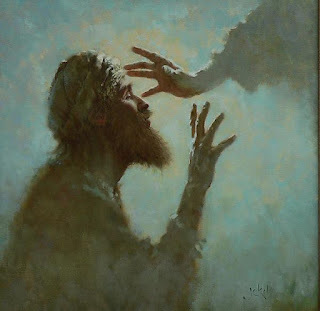 Even worse, if we are unwilling or don’t allow the Holy Spirit to perform “cataract removal surgery,” we continue to build barriers that make it impossible for others to clearly see Jesus. When we clearly see Jesus, He performs the radical surgery necessary for us to see the world as He sees it. Dear Lord, we pray that we will allow You to perform the surgery necessary for us to see the world as it is. In the Name of Jesus, Amen.